Edge Editor Haley Walker creates a weekly playlist to get your groove going on the weekend. Read about the songs below and listen here. This shoegaze-meets-dream-pop band from Colorado has mastered the art of fuzzy, daze-y rock sounds. Though relatively unknown until its release of “Anymore” this winter, Gleemer is carving a path in the emo-revival scene while touring with Movements. Catch Gleemer on March 29 or 30 in Tampa or Orlando. Australian psych-rock band King Gizzard & The Lizard Wizard is not only a mouthful but an earful as well. “All is Known” is a bouncy, guitar-heavy track off the last of five – yes, five – albums released in 2017. “Gumboot Soup” may be the truest to the group’s psychedelic roots, but check out the other four for some seriously innovative tunes – rock with notes of everything from microtonal music to jazz improvisation. A solo project of Will Toledo, Car Seat Headrest earned his cult following online after the 2011 release of “Twin Fantasy,” a lo-fi, guitar-heavy album recorded and produced in Toledo’s bedroom studio. “Cute Thing” is a track off the album’s 2018 re-release, which tones down the fuzzy sound to better showcase Toledo’s clever lyrics. Jeff Rosenstock sticks to his ska-punk roots with heavy distortion and lots of feedback. 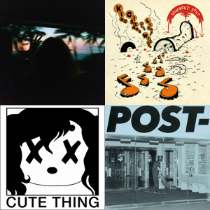 This anthemic track is from his well-received 2018 album, “POST-,” the follow-up to 2016’s “WORRY.” Rosenstock, despite being a bit older than his peers, is helping to define a contemporary brand of post-punk that criticizes both the political climate and the self. Oakland, California, native Melina Duterte is the mastermind behind Jay Som. After training to be a conservatory jazz trumpeter, 20-something Duterte decided to abandon her academic path in 2016 and record a demo record, “Turn Into,” in her bedroom. The success of this project attracted attention from Pitchfork, NPR and bands Peter Bjorn and John, Mitski and Japanese Breakfast, who then invited her to open their tours. Though he made his musical debut as the singer of Florida pop-punk band Polaroid, blackbear’s Matthew Tyler Musto soon switched his sound to R&B. After the success of his co-written Justin Bieber track, “Boyfriend,” in 2012, Musto embarked on a solo career. His 2017 album “Cybersex” received critical acclaim for its blending of genres and witty lyricism. Catch blackbear at Okeechobee Music and Arts Festival March 3. Formed from an online forum, the 14 members of pop-rap group BROCKHAMPTON call themselves the “internet’s first boy band.” It has earned a cult following in musically-minded millennials, who may be old enough to remember boy bands such as NSYNC and The Backstreet Boys, making the irony of that label even more apparent. While the group certainly churn out catchy melodies one would expect from a boy band, its hard-hitting and politically-critical lyrics are something One Direction never touched. Budding rapper Elizabeth Eden Harris got her start on YouTube when she was only 15. Though the 20-year-old’s vulgar lyrics and flashy outfits may have drawn the public eye, the songwriter uses her platform to make political statements and advance the female rap scene. Her 2018 album “Ephorize” earned its place on Pitchfork’s Best New Music list for its innovative production and social commentary. In 2018, electronic indie band MGMT made a massive comeback with the release of “Little Dark Age.” Though the group’s fame has been dwindling in the 11 years since the release of “Oracular Spectacular” and its subsequent shift toward the experimental, the band abandoned some of the weirdness and returned to that catchy, indie-pop sound with “Little Dark Age.” By no means, though, is “Little Dark Age” the stuff of radio hits. It may have accessible melodies and choruses, but it’s still seeping with strange sounds and whacky lyrics. The New York Times called Philadelphia experimental rock band Palm “one of the most ambitious and promising acts in today’s art-rock scene.” Its 2018 album “Rock Island” is no doubt a reflection of this. With polyrhythmic moments and abrupt structural changes, Palm’s new album is not easy listening. Somehow, though, lead vocalist Kasra Kurt’s soothing, Brian-Wilson-esque vocals unify each tune.